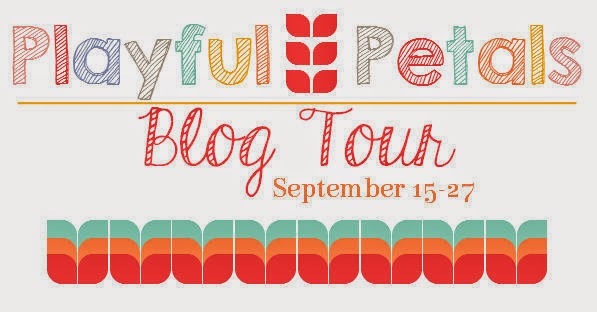 Corey Yoder's Playful Petals Blog Tour! I was super excited when Corey asked me to participate. I've been swooning over her beautiful creations on Instagram for some time now and her new book, Playful Petals, really caught my attention as I am OBSESSED with the petal shape right now! After checking out my e-copy (courtesy of C&T Publishing) I was highly impressed! The book is beautiful inside and out. Just filled to the brim with lots of eye candy and Corey's use of color is really inspiring! Her book includes tons of fabulous tips on fusible applique. She walks you through every step of the way and includes lots of great photos and options to help you become a confident appliquer. She also includes a great section on quilt making basics, fabric selection and using pre-cuts. 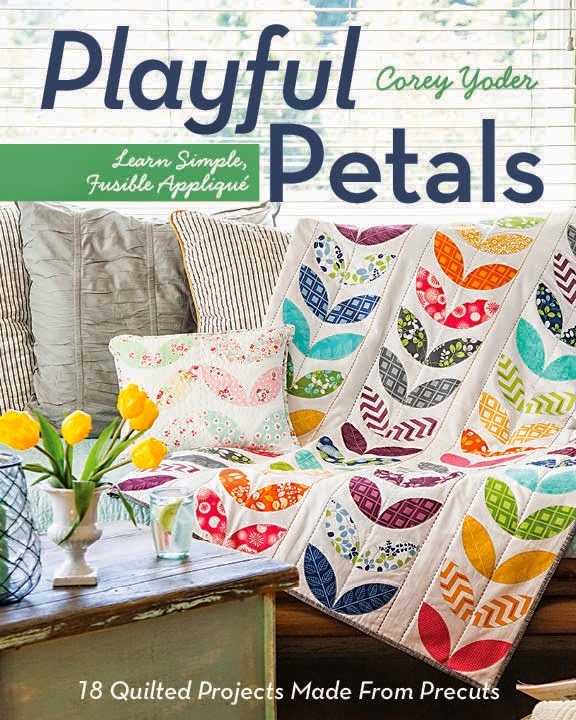 I also love the fact that each of the 9 beautiful quilt projects featured in Playful Petals has a coordinating mini project! It adds a fun pop of color to my family room and I guess it's fun to see it in a more modern, darker color way. It was really fun to make and I hope to find time to try some of the other projects in Playful Petals. Thanks to all of you for stopping by today. I do hope you'll check out the other stops on this blog tour to see more beautiful projects from Playful Petals. Sweet! Looks like a delightful book. It's on my list of 'must haves'. It will be well worth it! I would love to make several of the projects in Playful Petals. It looks wonderful. I like it in the darker colors too. Thank you! It was a fun little project and I like to try different color combos! Coreys version is so sweet though. Love your pillow, the brown very nice. Thanks! I love trying out different color combos! Your Pillow is Awesome!! Would go in our Son's home perfectly too! I'm a big fan of Corey's too! And the book does not disappoint! Thanks for your kind words! Thank you!! And the book is gorgeous! Scrap Jar Stars ~ Tutoroial & Giveaway! Feel free to link to this blog but please respect my hard work by not reproducing or publishing copies of my patterns, tutorials or posts. Please contact me with any questions or concerns. Thank you!